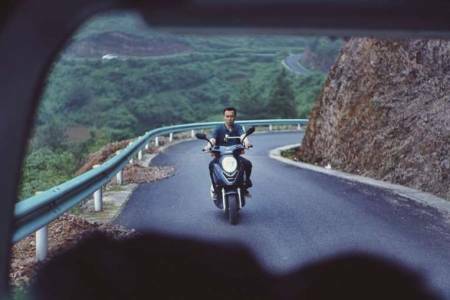 But I was thrilled, and found the latter sequences of Kaili Blues made me feel high -- high on this exotic world, on the joy of filmmaking and film-watching. I remembered the excitement when a tip in the San Francisco paper led me to a hitherto unknown movie house in Chinatown (or so I remember it) and I saw the first two films of Wong Kar-wai. I didn't make much sense of them then. But I had entered a new world, and was hooked. What Elly calls "a conventional Mainland indie" is dense with ethnographic detail (including visits to the Miau people from whom Bi Gan comes, the locations being his native region), a Diamond Sutra epigraph, intricate motives and backstories (with possibilities for future development) and it's not at all out of place for John DeFore to say in his Hollywood Reporter review that Kaili Blues "invites academic thesis-level dissection." But he is also right to add -- we feel the freshness of the energy and enthusiasm -- that "thanks in part to Chen's unforced performance, it never feels pretentious." Whoever wrote in the ND/NF blub calling this "one of the most audacious and innovative debuts of recent years" was certainly on the right track (despite a surprising lack of buzz since Locarno). There could be a glorious future here. Kaili Blues/Lu bian ye can/ 路邊野餐, 113 mins. debuted at Locarno, where it won Best Emerging Director and Special Mention awards. It also won the Montgolfière d'or award at the Nantes Festival of the Three Continents and also has been in the Vancouver festival, where one blogger noted technical flaws in the long hillside take camerawork. Shelly Kraicer provides loving details in a piece reprined in Cinemascope. It has been hailed by French critics ("of an unheard of virtuosity," Liberation; "a splendor," Les Inrocks) and it's coming out in France 23 March. Screened for this review as part of the 2016 Film Society of Lincoln Center-Museum of Modern Art series New Director/New Films. It will show Mon. 21 Mar. at 6:30 p.m. at MoMA and Wed. 23 Mar. at 6 p.m. at the Walter Reade Theater, Lincoln Center.